. Published on October 2, 2018 . “That’s show biz!” is a saying I heard a plethora of times during my first year here in Columbia College Chicago’s Music Composition for the Screen MFA program. This beautiful saying was the first thing I heard bouncing around in my head this year on the first day of scoring. Why, you may ask? Well, that would be due to the change of a December recording session to an October recording session. Naturally your fight or flight instincts kick in, and the first thing I thought was “Well, that’s show biz.” And so the preparation started. 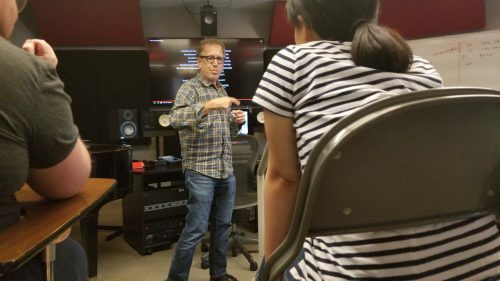 We here at Columbia are lucky enough, during our time here, to study under men and women who work in the music composition for the screen industry. In the spring of 2018, we studied under our composer in residence David Wingo (Mud, Barry, Take Shelter, Midnight Special) and worked our way through a film he composed for called Midnight Special. This involved 7 weeks of in-depth scoring and reviews to turn out scenes that reflected what was expected of David by the director when he worked on the film himself. In the same light, our first composer in residence this semester is Peter Golub (These Amazing Shadows, The Great Debaters, The Laramie Project). During his residency here, we are working on the film The Laramie Project. This, like our work with David, consists of 7 weeks on intensive learning, scoring, and rewriting, all leading up to the end our our studies with Peter, which is our recording session. Now this is where my first year experience has come to help me. I taught myself one very important thing during my first year and that is time management. I was able to step into my zone, get my calendar out, and start making a schedule for myself from day one to completion, and so far, so good. This is a crucial thing for success: if you don’t have good time management skills, you will never finish your projects the way you want to, when you want to. You will always feel behind and like there is no hope. So, let me say: if there is one thing that you should do for yourself, it’s work on your time management skills, because the unfortunate reality is that just because a recording session is coming up, that doesn’t mean your other classes stop. Just like in the real world, you can’t work on one thing at a time. In our industry, time management and multi-tasking are key! We are officially in crunch-time now, and I am a mixture of excitement and anticipation. 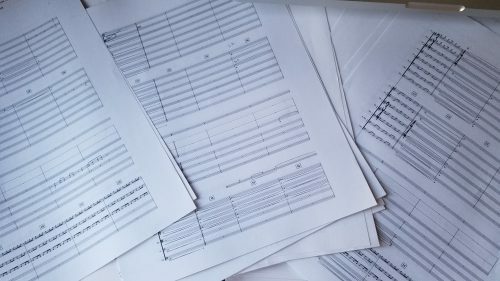 Thanks to my time management skills and the support of my cohort, I have printed scores, prepped tracks for recording, and reviews are set up for this coming Friday. Then it’s on the grind until October 10 when we finally get to hear our work being played and produced live at the Chicago Recording Company. A large reason why I came to Columbia was for these exact opportunities, even though they are chaotic at times. I remember listening to the recordings of alumni and getting excited to take on what the school had to offer. It’s not every day you get to record at places like CRC or on a Los Angeles scoring stage. So even with the chaos, I stay happy, excited, and ready for what’s to come today, tomorrow, and everyday thereafter. Until next time my friends, best wishes and happy composing. Second year Columbia College Chicago MFA student in Cinematic Composition. I love working on Films and original compositions. In my spare time I love Hiking and hanging out with my Wife and 2 dogs.